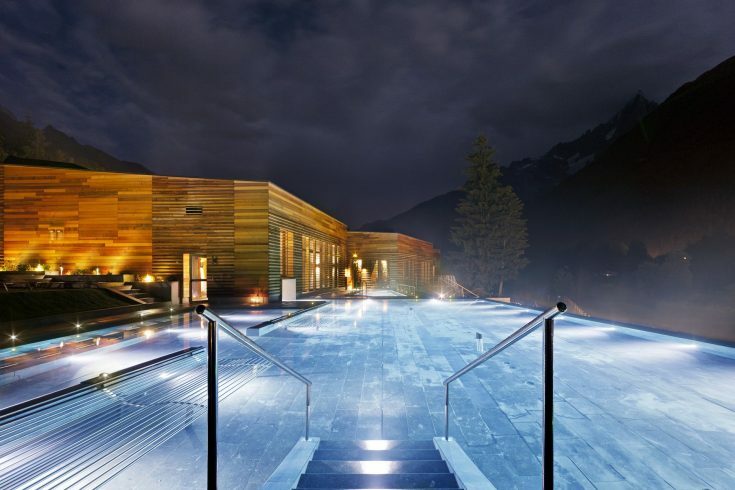 The new and beautiful spa in Chamonix is now open! Very reasonably priced at around €50 for day or evening entry including aperitif and light buffet. Daytimes are quieter but it’s lovely to go a little before sunset and catch the light on the peaks. Always reserve online first, they have limited capacity. You pay on entry, the card isn’t charged. It’s not tremendously well signposted yet, so check the map and have the address on your phone when you go. You can walk there (20 mins), or park at the Tennis club parking. This is on the back road to Chamonix, so turn right onto the main road from the chalet, and then take the third right from the roundabout, driving back towards Chamonix through Les Praz past the grocery. The tennis club parking is 1km further on. Cross the footbridge and follow sign to “Centre de bien-etre” – right from the bridge then first left. Their own map is very confusing – I have marked the route from the parking in red below. Remember the number on your robe, it’s easy to forget where you left it! Or take a bit of ribbon or coloured string or scarf for identification. Robes don’t have pockets so I like to take a very small bag for my phone, for pics. The water is at around 36° so I find it best to get nice and hot first. I recommend heading straight for the saunas and steam rooms (I especially like the menthol one), and then alternating between the water rooms, the relaxation rooms and of course the enormous outdoor pools. The ‘ski sauna’ and mentholated “hammam des étoiles” are on the lower floor with the women’s changing rooms and are generally much quieter than the main floor, an ideal place to start. The colossal waterfall of the ‘Cascade du Dard’ room is maybe my favourite, get down low for an efficient massage from the falling water. Or float in the colour changing pool which plays music that you can only hear underwater. When you find yourself ‘pruning up’ a bit with all the water, the beautiful pink Himalayan Salt room upstairs is ideal to relax in. Also the Face Gym is fun! 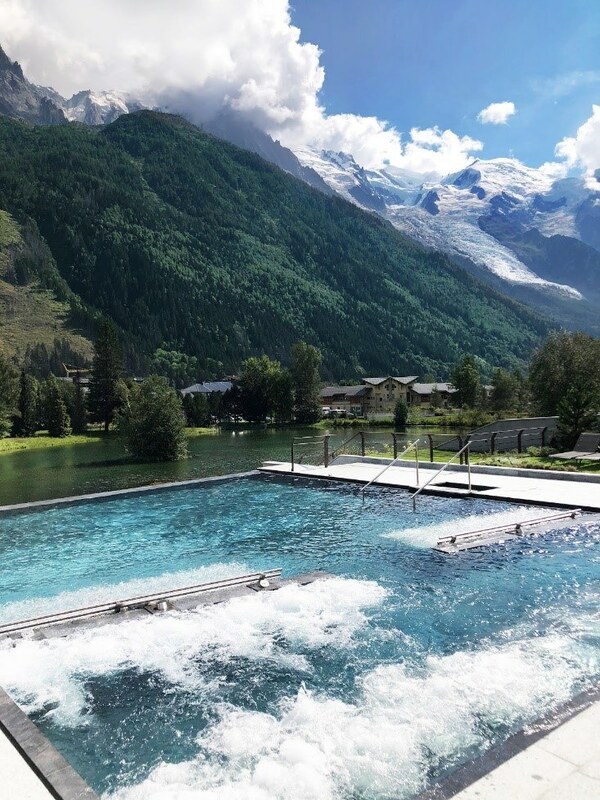 The star attraction though is definitely the huge outdoor pools, whose underwater chairs and loungers have varying pressures of bubbles and a spectacular view of the Mont Blanc Massif. There are some extras to explore like the outdoor waterfall pool (below and to the left of the main one). Check the time of the buffet as it’s hugely popular and worth getting there either five to ten minutes before it opens to bag yourself a good table, or wait an hour until the first rush is past. Ideally if there’s more than one of you, one gets the table and one gets the drinks. You can go back as many times as you like once you’re established at your table :). 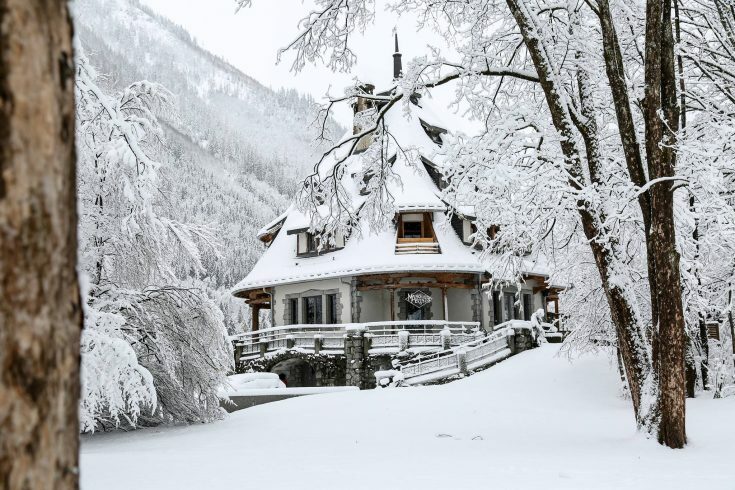 One of the best in the area is a 40 min drive away in Italy – the lovely baths of Pre-St-Didier are close to Courmayeur, and are a wonderful place to spend a day. 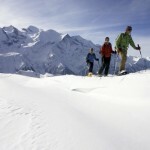 Visit Courmayeur afterwards to enjoy its lovely stone streets and shops. A drive of less than an hour through beautiful scenery takes you to the beautiful Swiss spa complex of Lavey-les-Bains. Kids also love the thermal baths here. 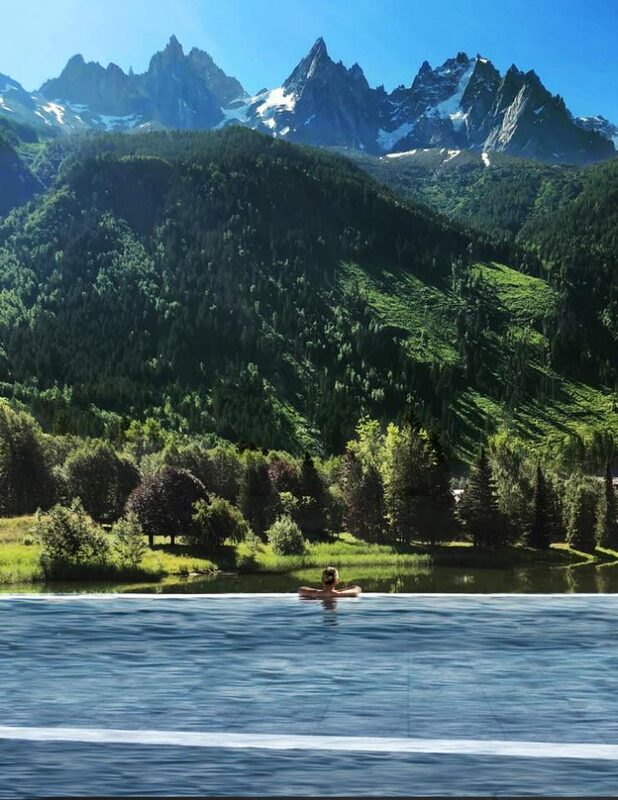 For simpler pleasures, swimming in a huge pool complete with giant waterslide, sauna and steam rooms, gym, ice rink, indoor climbing and tennis are among the facilities available at the Chamonix Centre Sportif. World champion snowboarder Eva now runs the superb Le Salon in central Chamonix for great haircuts and also offers lovely spa treatments. Shops open from 9am to 12 noon and then 2pm until 7 pm. Almost nothing opens 12-2, so settle in for a good lunch! Once you’ve sipped your irreproachable coffee, explore Chamonix’s shops – from upmarket boutiques like Chanel, Svarovski and (of course!) 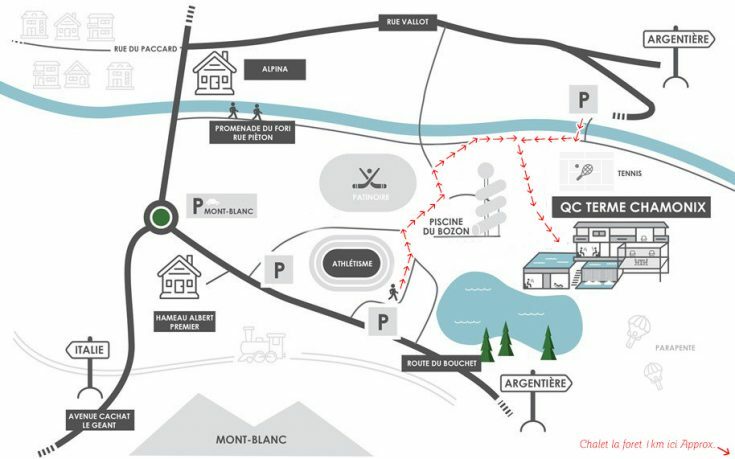 Mont Blanc to lovely interiors shops stocking exclusive French marques of homeware, such as the wonderful textures of Arpin, Othentiq, Rêves d’Hiver on the street leading up to the train station, and Le Chalet de Jules on the roundabout with the silver birches.